MONTREAL -- There have been so many words used to describe Montreal Canadiens icon Jean Beliveau over the past week. Class, grace, dignity, respect; the list of accolades is long. But one of the words repeated most often is humility. Beliveau was not a man who liked speaking of his greatness, in spite of how obvious it was. 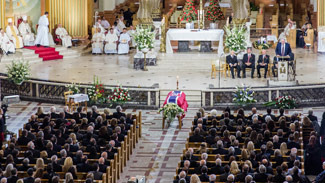 One can only imagine what Beliveau would have thought Wednesday when he was laid to rest in a state funeral at Mary Queen of the World Cathedral eight days after he passed away at his home at age 83. The tributes that came from former teammates, dignitaries and a who's who of the hockey world likely would have been difficult for a man as humble as Beliveau to hear. "His presence didn't diminish others but made others better," former Canadiens goalie Ken Dryden said during his eulogy. "He had other skills and might have done other things, but he understood probably early in life that his greatest impact wouldn't be as a corporate or political leader, but as Jean Beliveau, in doing what he did and in being who he was. "As a great star, he had a responsibility; he knew to live not as a star but as a good person." All three levels of government were represented with Canada Prime Minister Stephen Harper, Quebec Premier Philippe Couillard, and Montreal Mayor Denis Coderre in attendance. Former Prime Ministers Jean Chretien, who once asked Beliveau to serve as Canada's governor general and was turned down, and Brian Mulroney also were here. NHL Commissioner Gary Bettman, Pittsburgh Penguins owner Mario Lemieux, Toronto Maple Leafs president Brendan Shanahan, and New York Rangers coach Alain Vigneault are a small sample of the hockey world who attended. In an ornate cathedral, with 1,500 people inside and scores of others watching outside on big screens in a driving, bitter snowstorm, Beliveau's life was honored in a way that had not yet been covered over the two days he lay in state at Bell Centre and in the touching tribute the Canadiens organized prior to their game against the Vancouver Canucks on Tuesday. Again Wednesday, tears were shed, stories were shared, a life was celebrated. "It's hard because he's such an important part of our organization," Canadiens president Geoff Molson said following the service. "He was with us for more than 60 years. He did so much for so many people. It's hard to see a man like that go because there will never be another one like that." Beliveau's coffin, draped in a Canadiens logo, entered the cathedral with former teammates Serge Savard, Guy Lafleur, Yvan Cournoyer, Phil Goyette, Bobby Rousseau and Jean-Guy Talbot serving as pallbearers. Beliveau's wife, Elise, a woman the entire hockey world has come to know this week as a pillar of strength in this difficult time, followed with her daughter Helene and her granddaughters Magalie and Mylene. Then came a group of Canadiens alumni, a group 40 or 50 strong. The lone exception was Toronto Maple Leafs legendary goalie Johnny Bower, who never played for Montreal but wanted to walk with them. Finally, the current edition of the Canadiens, led by general manager Marc Bergevin and coach Michel Therrien, made its way into the cathedral for the service. Cournoyer, Savard, Molson and Dickie Moore delivered eulogies in addition to Dryden, who was essentially Beliveau's teammate only during Montreal's run to the Stanley Cup in 1971, Beliveau's final season and the final one of his 10 Cup championships as a player. "This man raised the prestige of the National Hockey League through his dignity and his integrity," Savard said. "He had the respect of his teammates, his opponents, the people who ran the League, and obviously of all the fans in the hockey world." Molson mentioned the ways Beliveau impacted hockey as we know it today, most notably his three goals in 44 seconds on a single power play that forced the NHL to change the rule and have a power play end when a goal is scored. Molson also underlined Beliveau's innovation of parading the Stanley Cup around the ice, something he was the first player to do. Though today it is largely seen as a celebratory victory lap for the winning team, Molson said Beliveau first did it in order to allow the fans in every corner of the building to be closer to the Cup, his generosity of spirit shining through again. "His victories were our triumphs," Molson said. Molson has known Beliveau his entire life, even though he retired as a player when Molson was barely a year old. He grew up with Beliveau in his life, and it was clear how difficult it was going to be not to have that presence any longer. "He was in a class of his own," Molson said. "He was Jean Beliveau." Cournoyer's bond with Beliveau was special, calling him "my captain" because Beliveau was Cournoyer's first captain with the Canadiens and provided the lessons Cournoyer used when he became captain in 1975. Cournoyer broke down in tears as he addressed Elise Beliveau, calling her an exceptional woman. "Jean, we feel a great void in our heart and will remember you and never forget," Cournoyer said. "This rose I'm wearing today I will keep for the rest of my life to remember you, oh captain, my captain. Bon voyage." At the end of the two-hour service, everyone was in agreement that it could not have been handled better, typical of a week when everything the Canadiens did to honor Beliveau was flawless and tasteful, much like the man himself. "It was something that you knew to expect, but then seeing it in reality exceeded the expectations," Commissioner Bettman said. "It was a great tribute to a great man." The service marked an end to a week of tributes, testimonials, ceremony and memories, a difficult time for those close to Beliveau and those who idolized him. But it was a valuable week, because a generation of hockey fans got an opportunity to learn who Beliveau was beyond the elegant Canadiens ambassador who was a fixture at Bell Centre for years, cheering on his team. They saw video clips of Beliveau's graceful skating stride, his incredible stickhandling skills, his imposing presence on the ice. But now, his funeral marks an end to much of that, and Beliveau's family will get an opportunity to mourn privately after doing so in public. And Beliveau, according to Savard, has a date with old friend Maurice Richard. "Jean, the Rocket is sitting at the head table of our national legends," Savard said in his eulogy, "and he's inviting you to pull up a chair and sit next to him."